Enrico Anthony Lazio (/ˈlæzi.oʊ/; born March 13, 1958) is a former four-term U.S. Representative from the State of New York. Lazio became well-known during his bid for U.S. Senate in New York's 2000 Senate election; he was defeated by Hillary Clinton. Lazio also ran unsuccessfully for the 2010 New York State Republican Party gubernatorial nomination. Lazio was born in Amityville, New York, in Suffolk County, on Long Island. He is the son of Olive (née Christensen) and Anthony Lazio, who owned an automotive parts store. His father was of Italian descent and his maternal grandparents were Danish immigrants. He graduated from West Islip High School in 1976. He received his A.B. from Vassar College in 1980 and received his Juris Doctor from the Washington College of Law at American University. Prior to being elected to Congress, Lazio was appointed executive assistant district attorney for Suffolk County in 1987, and served in the Suffolk County Legislature from 1990 to 1993. Lazio represented New York's 2nd congressional district as a Republican. He was first elected in 1992, defeating the incumbent, Thomas Downey, who had served for eighteen years. Lazio served four terms from 1993 to 2001. In Congress, Lazio served as Deputy Majority Whip, Assistant Majority Leader, and Chairman of the House Banking Subcommittee on Housing and Community Opportunity. He was "widely viewed as the most influential moderate in a leadership dominated by conservatives." From his earliest days in Congress, Lazio made housing one of his primary issues. As leader of the housing subcommittee, he drafted the Quality Housing and Work Responsibility Act of 1998, the most significant piece of housing reform legislation in 60 years. When President Clinton signed it into law, he said that it "made landmark housing reform a reality." Lazio's legislative accomplishments in the housing area also included the Native American Housing Assistance and Self Determination Act (NAHASDA). Enacted into law in 1996, NAHASDA provides housing assistance to Native American communities. It also created a new HUD division, which combined several pre-existing programs into a single block grant program committed to the task of tribal housing. Outside of the housing area, Lazio introduced the Ticket to Work and Work Incentives Improvement Act of 1999, which allowed Americans with disabilities to enter the workforce while maintaining their health insurance. That legislation also passed and was signed into law. During his time in Congress, Lazio championed the case to award a posthumous Congressional Medal of Honor to President Theodore Roosevelt for his charge up San Juan Hill in the Spanish–American War. Congress eventually passed legislation asking the president to grant the honor, and President Clinton awarded the medal in January 2001. Lazio also sponsored the Wartime Violation of Italian American Civil Liberties Act, which, after being passed and signed into law in 2000, directed the U.S. Attorney General to review the government's internment of Italian nationals during World War II. In addition to his position on the Financial Services Committee, Lazio also served on the House's Energy and Commerce Committee, and on the Presidential Commission on Holocaust Assets in the United States. In 2000, Lazio ran for the U.S. Senate from New York and was defeated by Hillary Clinton in the race to succeed Daniel Patrick Moynihan. His comparatively late entry into the race (five months before Election Day) followed New York City Mayor Rudolph Giuliani's decision to withdraw from the Senate race. Lazio announced his candidacy for Senate on all five major Sunday morning talk shows on the same day, making him the second person ever to complete a Full Ginsburg. During the senatorial campaign, Lazio was asked by the SEC to produce documents relating to his stock option trading in discount stock brokerage Quick & Reilly, a division of FleetBoston Financial. After Lazio responded to the inquiry, the SEC took no further action. The race between Lazio and Hillary Clinton became the most expensive Senate campaign ever conducted at the time. In a September 13, 2000 debate, Lazio left his podium and asked Clinton to sign a document affirming a pledge to abstain from benefiting from "soft money." Clinton refused. Years later, Lazio acknowledged regretting the style with which he made his point, but maintained that "[o]n substance, it was right." Lazio had given up his House seat to run for Senate. Following his loss in the Senate election, he became CEO of the Financial Services Forum, and, later, the managing director of global real assets for JPMorgan. Lazio declared his candidacy for governor of New York in New York City on September 21, 2009 and made a formal announcement in Albany, New York the following day. On June 2, 2010, Lazio received the New York State Republican Party's designation to run for governor, but Carl Paladino, a candidate backed by the Tea Party movement, petitioned his way onto the ballot and won the Republican gubernatorial primary on September 14, 2010. On September 27, Lazio, who had won the Conservative Party primary, confirmed that he would drop his bid for Governor by accepting a nomination for a judicial position in the Bronx. Since 2012, Lazio has led the New York office and the national housing finance practice group of Jones Walker LLP, a 400-lawyer law firm headquartered in New Orleans, Louisiana. He sits on the executive committee of the J. Ronald Terwilliger Foundation for Housing America's Families, and the board of trustees of Enterprise Community Partners. He continues to write frequently on issues of public policy and make appearances on national cable and broadcast television shows. He has previously served as a guest host of the O'Reilly Factor and Hannity, and has appeared on shows including AC360, Meet the Press, This Week, Face the Nation, Larry King Live, HBO's Real Time with Bill Maher, The View and Fox Sunday. ^ Barry, Dan (July 5, 2000). "A GROWING AMBITION: A special report. ; Behind the Lazio Smile Lies a Deliberate and Pragmatic Substance". The New York Times. ^ Smith, Chris. "Which Rick Do You Pick?". New York. ^ Jessica, Winum. "Four Housemates on Top of the World: Politician, CEO, Media Mogul, and Entrepreneur". Vassar Quarterly. ^ a b "Revolving Door: Rick A Lazio Employment Summary". Open Secrets. ^ Baranel, Josh. "THE 1992 ELECTION: NEW YORK STATE -- U.S. HOUSE RACES; Green and Downey Lose as New York State Delegation Changes Dramatically". The New York Times. ^ Dao, James. "TIES THAT BIND: A special report. ; Lazio's G.O.P. Role Is a Campaign Asset But Also a Liability". New York Times. ^ Lambert, Bruce. "Lazio Sought to Make a Legislative Mark in Housing". The New York Times. ^ a b Podhoretz, John (June 9, 2000). "LAZIO MADE A DIFFERENCE – HIS HOUSING REFORMS MEAN BETTER LIVES FOR 200,000 NEW YORKERS". New York Post. ^ Kilian, Michael (November 11, 1998). "Teddy's Rough Ride". Chicago Tribune. ^ "Medal Of Honor For Teddy Roosevelt". Chicago Tribune. January 12, 2001. ^ Levy, Clifford. "Lazio Sets Spending Mark for a Losing Senate Bid". The New York Times. ^ October 1, REID J. EPSTEIN; Pm, 2008 8:33. "Lazio admits mistake in debate with Clinton". Newsday. Retrieved March 16, 2019. ^ Vielkind, Jimmy. "Lazio's 2009 JPMorgan Bonus: $1.3 Million". Observer. ^ Web Staff (September 21, 2009). "Lazio announces candidacy for governor". TWEAN News Channel of Albany, L.L.C d.b.a. Capital News 9. ^ "Long Islanders put Paladino to test as their cup of tea". Buffalo News. September 12, 2010. ^ "Leadership". The J. Ronald Terwilliger Foundation for Housing America's Families. ^ "Board of Trustees". Enterprise Community. 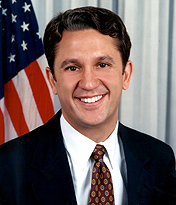 Wikimedia Commons has media related to Rick Lazio.